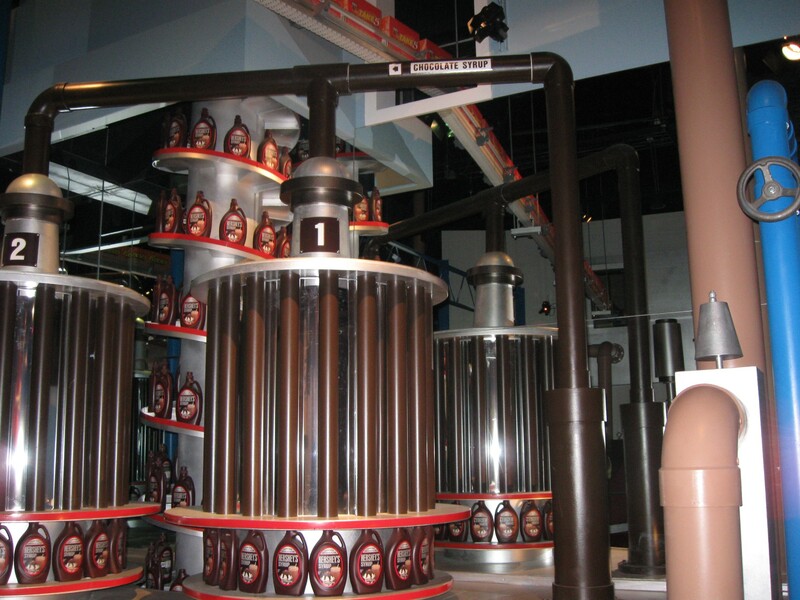 Our 2010 Road Trip, Part 5: The Chocolate Factory « Midlife Crisis Crossover! Don’t call them the Three Musketeers. That’s a different company. The bulk of Hersheypark in the heart of Hershey, PA, is basic top-notch amusement park rides. As you’d expect, one building in particular housed an animated tribute to the cornerstone of the city’s economy and the source of sugary happiness throughout all the land: the mass production of chocolate and chocolate-based goodies. 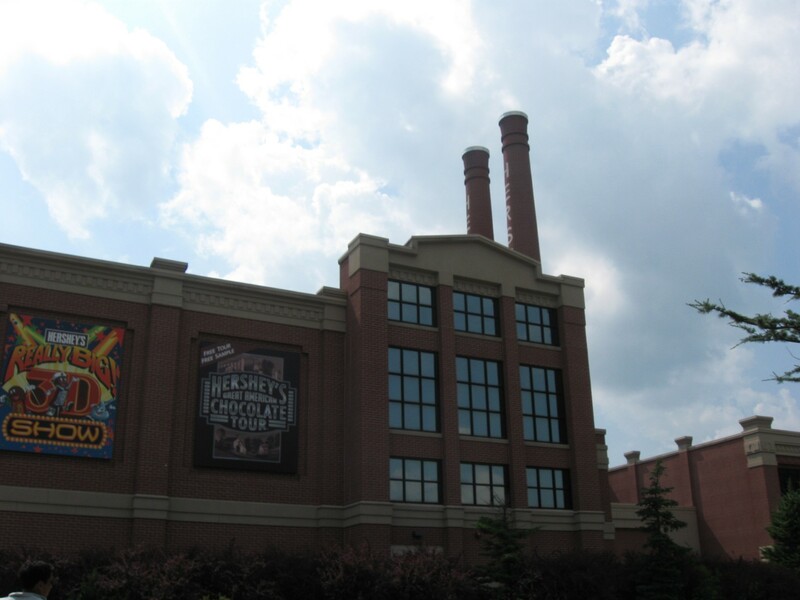 Hershey actually has a factory presence in town, but that was a different set of buildings. We saved the free pretend-factory tour for later in the day, after my energy level had reached zero and begun to hold everyone else back. 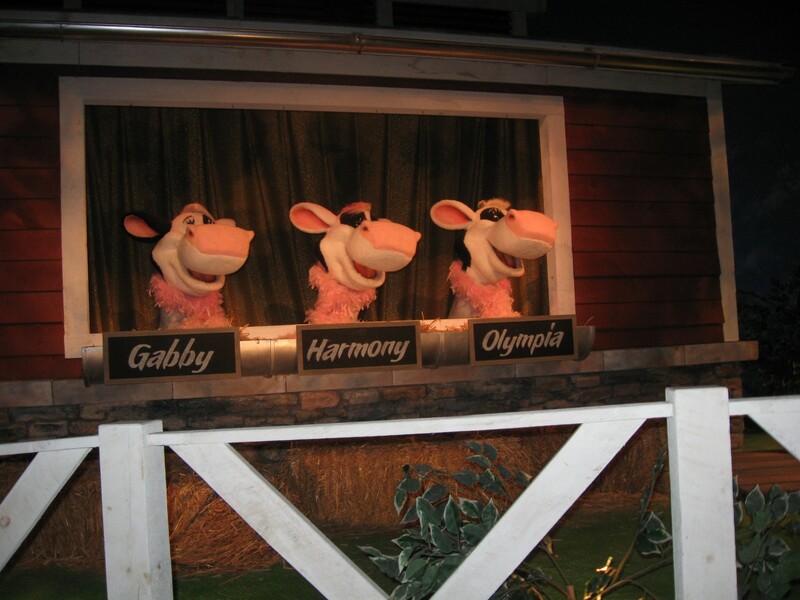 Guests were seated in amusement-park cars that carried us through an animatronic tour that teaches the facts of life vis a vis Where Chocolate Comes From. First there are milk-bearing singing cows. Gabby, Harmony, and Olympia seem very happy in their work. The dark truth rears its head: the three sisters’ oppressive male overlord conducts their musical numbers and demands unconditional lactational devotion. 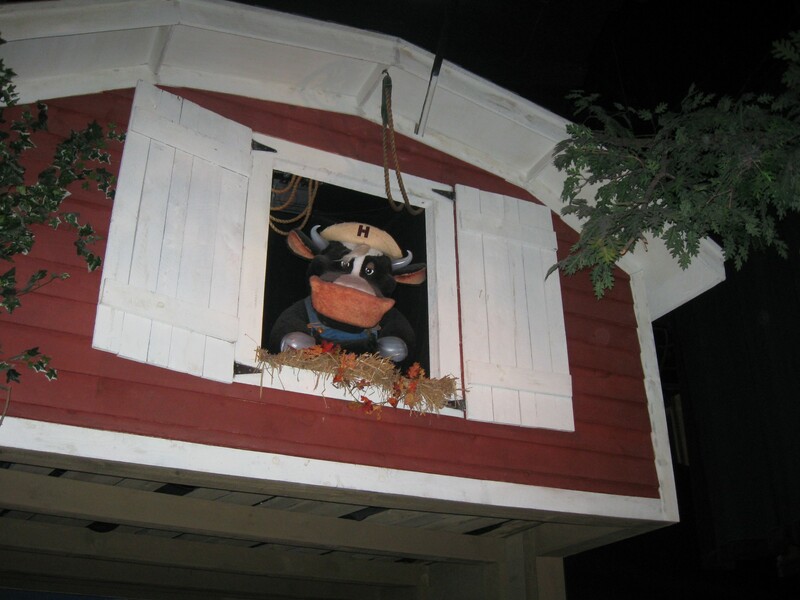 Following the living cartoon cattle were several scenes involving vats, conveyor belts, milk, beans, heat, churning, and stirring. 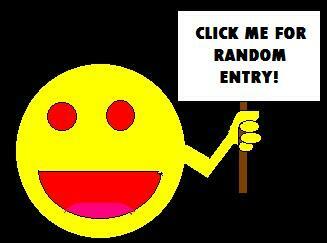 This all culminates in the important part: snack food on parade! 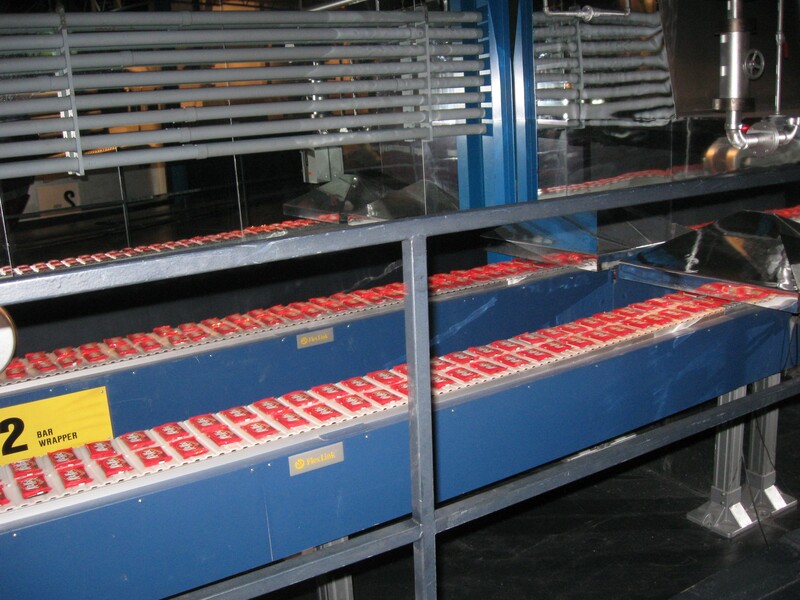 The march of the Kit-Kat bars on their way to go have their pieces broken off. Chocolate pipes brimming with Hershey’s Chocolate Syrup that will soon bring new life to ice cream and milk all across the land. When we exited the tour, they gave us a free miniature chocolate, then herded us to the gift shop, a chocolate fantasy of every Hershey candy you’ve ever seen, many you haven’t seen for years, some you’ve never seen, and some that may have haunted your wildest dreams. 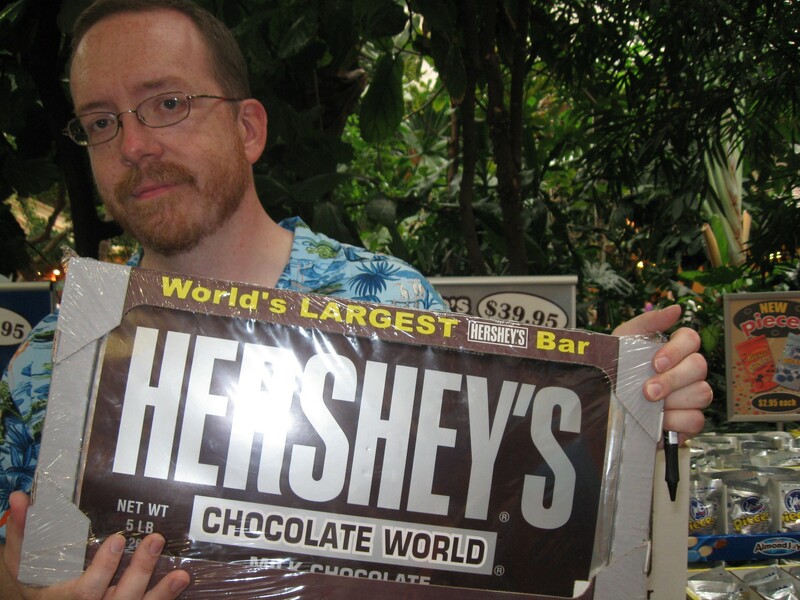 A five-pound Hershey bar is only the tip of the iceberg in the ocean of the planet in the endless chocolate dimension that is Hershey’s Chocolate World. For one low price of just $39.95, this giant chocolate bar can be yours! You’ll never need to go trick-or-treating or accept Christmas candy ever again! Beyond just candy, they also had a Hershey Marketplace with non-edible souvenirs, fresh baked goods with chocolate toppings (that’s where my money went), and full-service non-chocolate restaurant foods we could eat for dessert such as sandwiches and salads, but not until we finished our chocolate main courses first. 1. 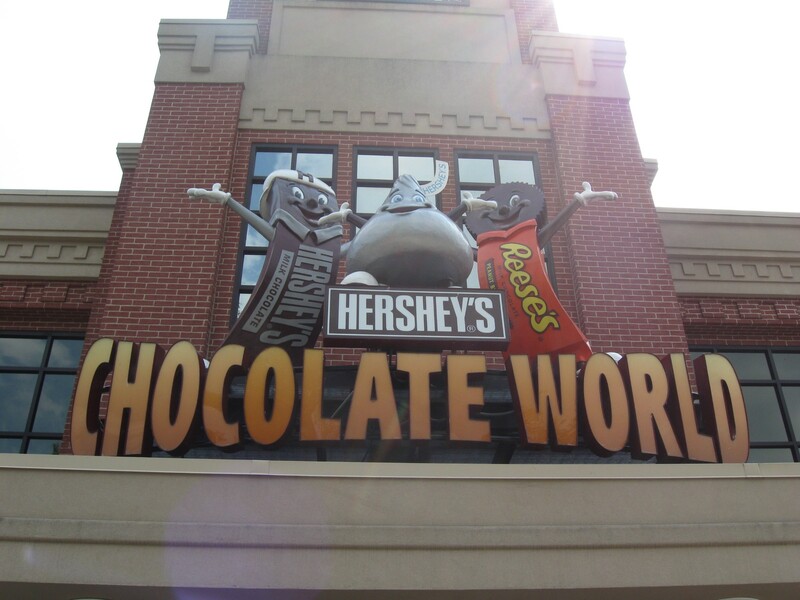 The “Hershey’s Chocolate World” logo would reenter our lives when we visited their Times Square store on our 2016 return to Manhattan.